This is a little bit off from my usual blog post, but I wanted to share something that has been very successful for us. Around the time my daughters were 3, 6, and 9, I was looking for something to help them understand the idea of earning and spending. And I was also looking for something that give us another avenue for rewards and consequences to manage behavior. I read somewhere, probably Pinterest, about using a marble system. We decided to try it out. My daughter’s each have a marble jar. It has been important to us from the beginning that they see their chores as being done because they are a part of the household, not because we are paying them to do it. So we had a debate about what we wanted to use the marble rewards for. We decided that marbles would be worth about 1 cent a piece if they ever wanted to turn them in for money. We also decided that each day for doing their chores they would get one marble. This made the payment pretty low, but still gave them a regular way to start earning marbles. Then marbles are earned for other things too, like doing extra jobs, helping mom out in a pinch, and random acts of kindness. 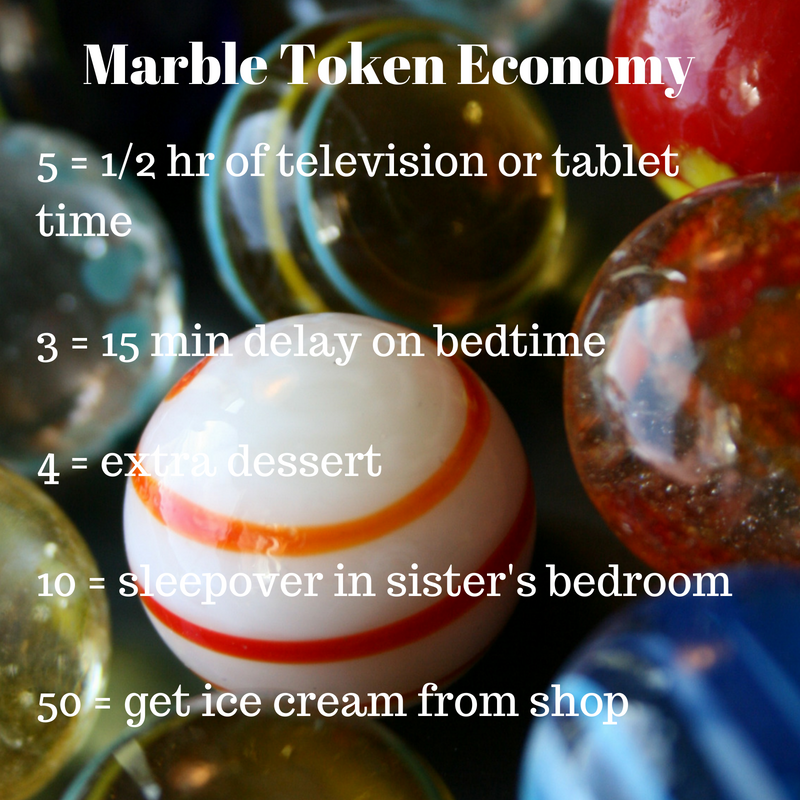 These are all reasons that they get marbles, but they are not guaranteed marbles for every one of these. There are times when I ask them to do these things because they are a member of the household. In those cases they do not get marbles, but in other cases they are offered a certain number of marbles to help out with a task. We have been thrilled at the outcome of setting up this system with them. The girls have taken to it easily. The benefit for them has been greater than I expected. This is what they have learned. 3)It gives them a tool to use to work with other people- they bargain each other for how to spend them and put their marbles together so they can buy more. 7)There are several times where I could use help with a household task but I don’t want to make them do it without reward. This way I get the help I want and they get more to spend. 8)We haven’t had to spend real money to give them the lessons and value that come from learning to earn, weigh purchases, and spend. I would encourage you to try this out. I have been expecting my 12 year to out grow it, but she hasn’t yet. She still enjoys having marbles to spend to get extra goodies at home.